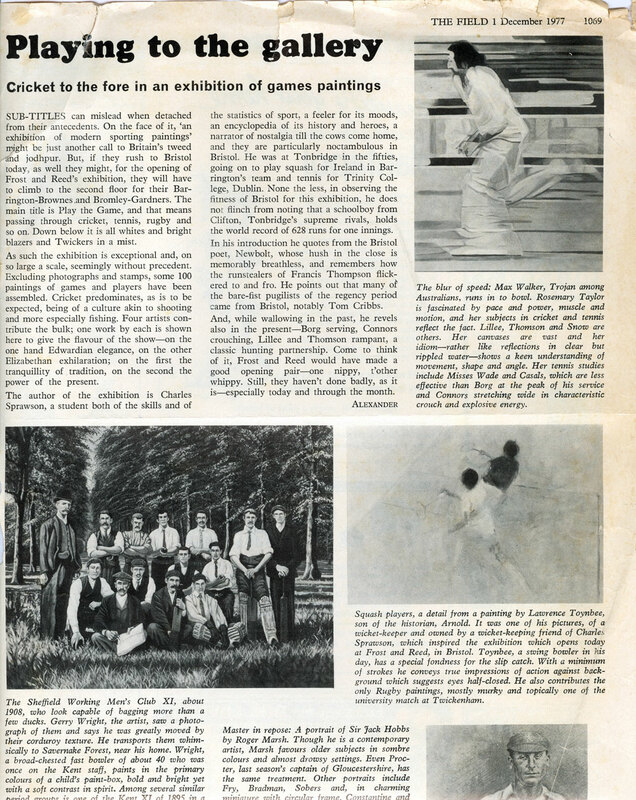 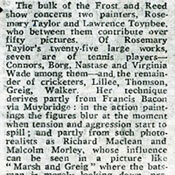 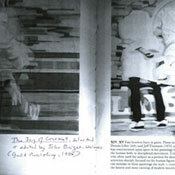 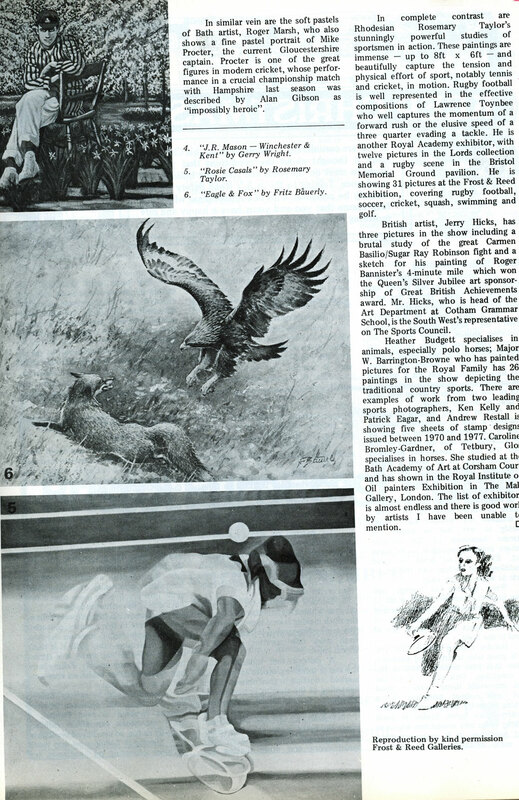 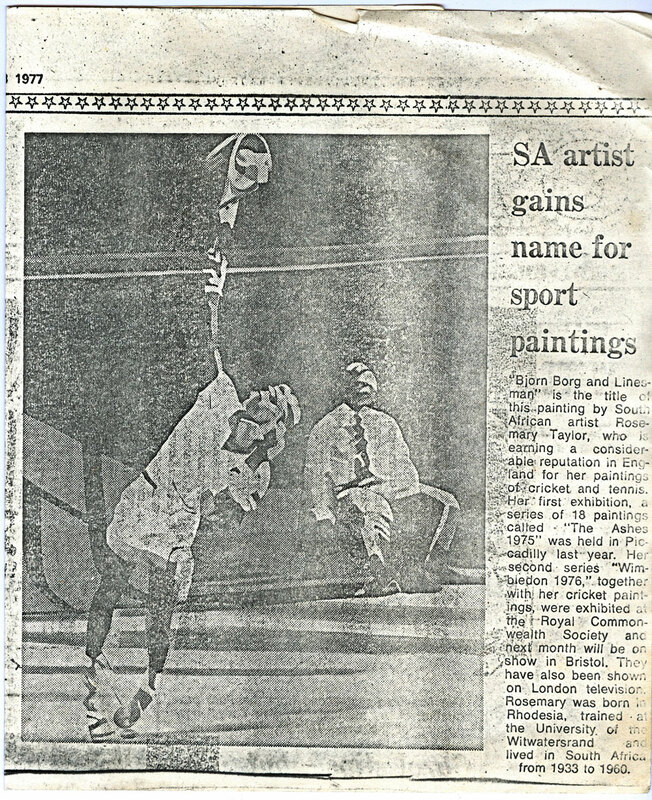 Rosemary Taylor’s sports paintings were widely exhibited in the 1970s. 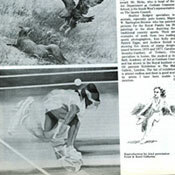 These powerful studies of athletes in movement were greeted with much acclaim. 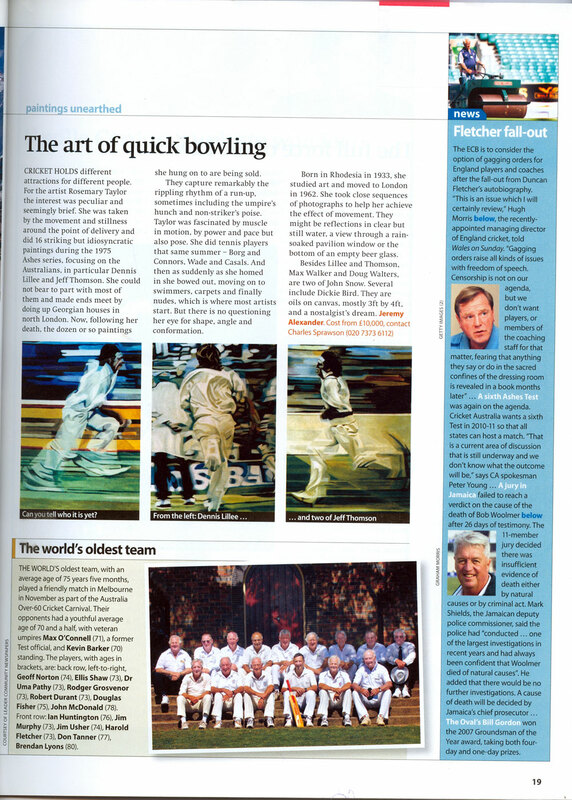 Here’s a snapshot of the positive comments from the media…. 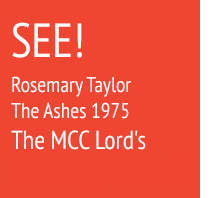 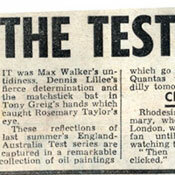 ‘Rosemary Taylor was not a cricket fan, until she started watching the Tests on TV. 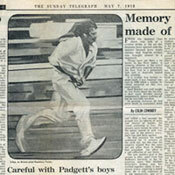 Then something clicked, it was the most extraordinary movement, the sheer beauty and total concentration of the players.’ – Ian Jarrett, The Sun, Thursday, May 20th 1976. 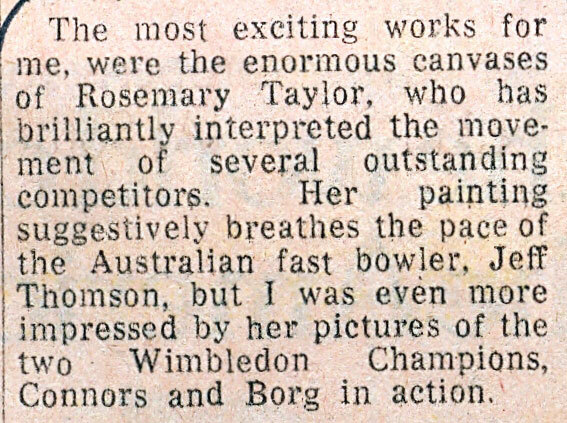 ‘Rosemary Taylor is not a sports type. 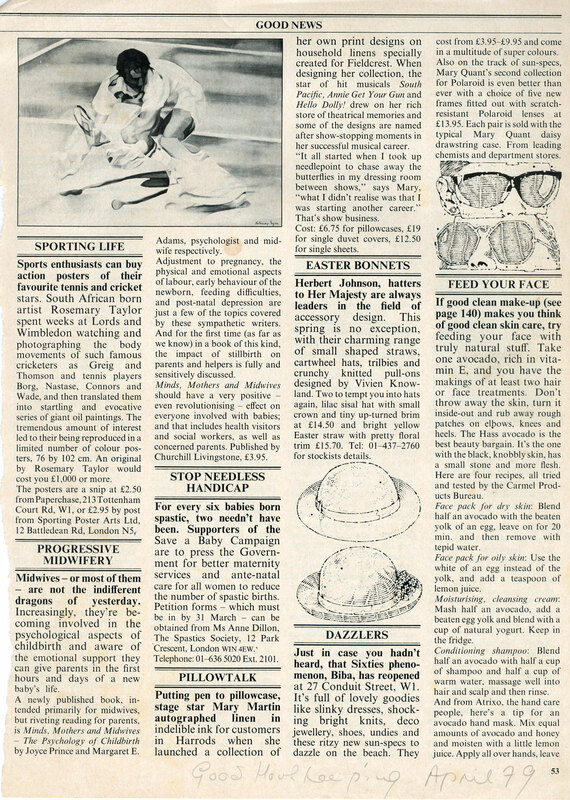 She is interested only in “balance and body movement of leading athletes” paying a fortune to the touts every day at Wimbledon where she took in her sketch book and camera. 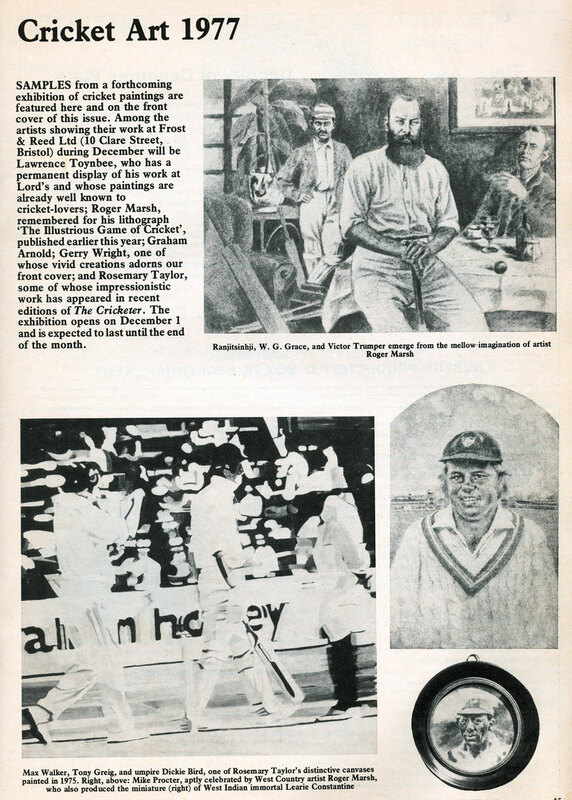 At Lords, she had to rely on sketches for they would not let her take photographs. 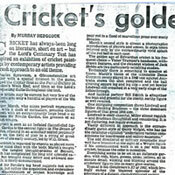 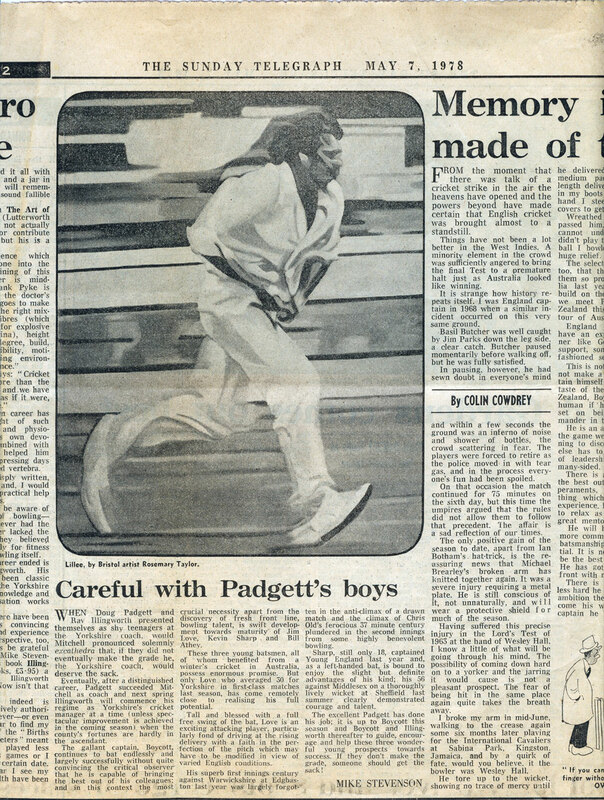 It obviously didn’t matter.’ – Frank Keating, Sports Guardian, Monday, October 17th 1977. 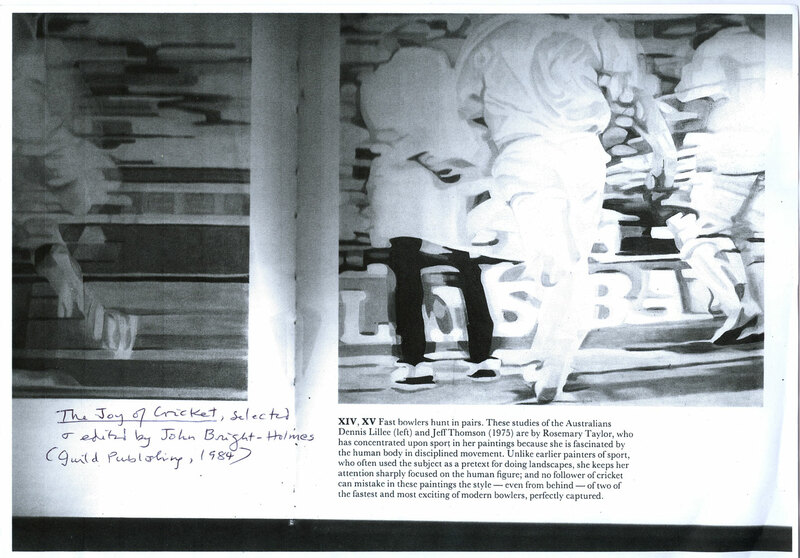 (3 images - Marsh and Greig, Connors, Borg and Linesman). 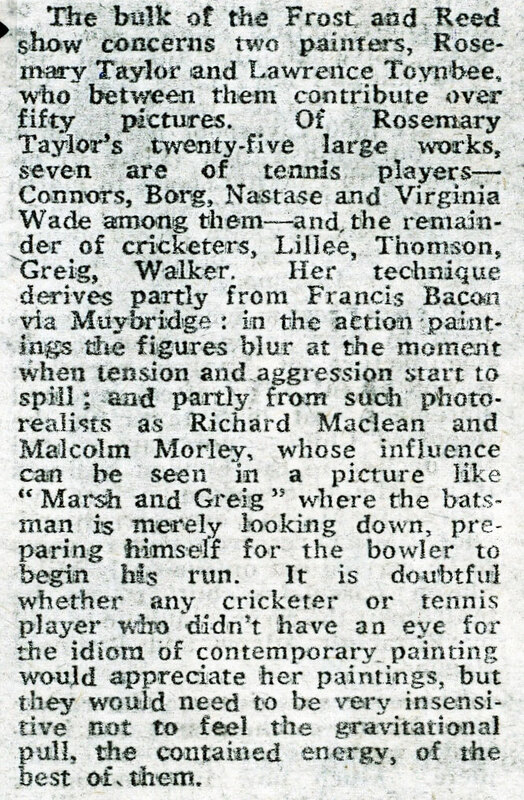 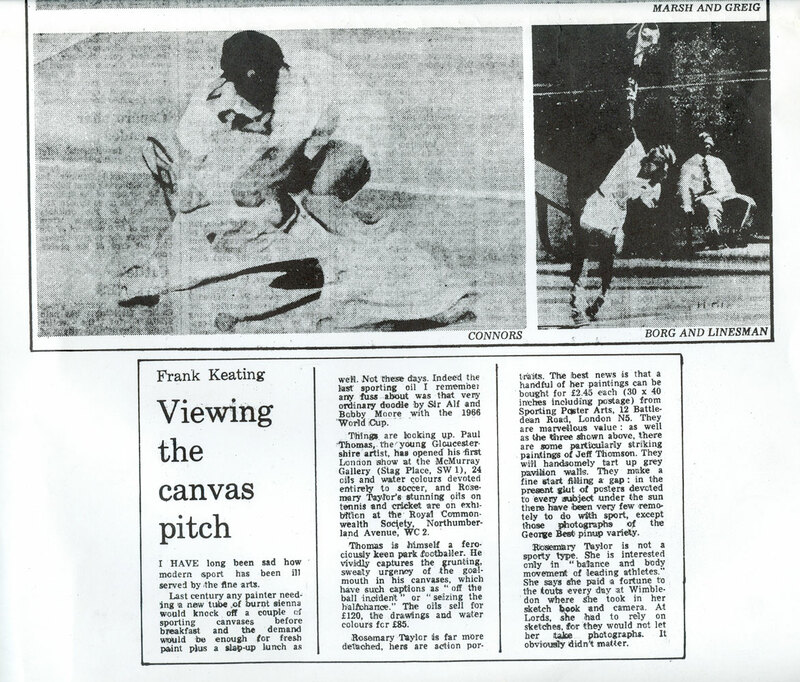 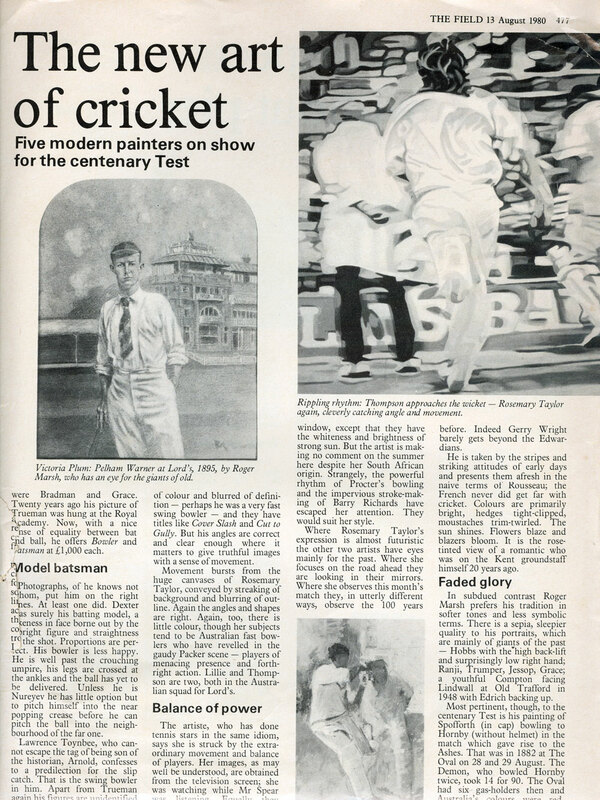 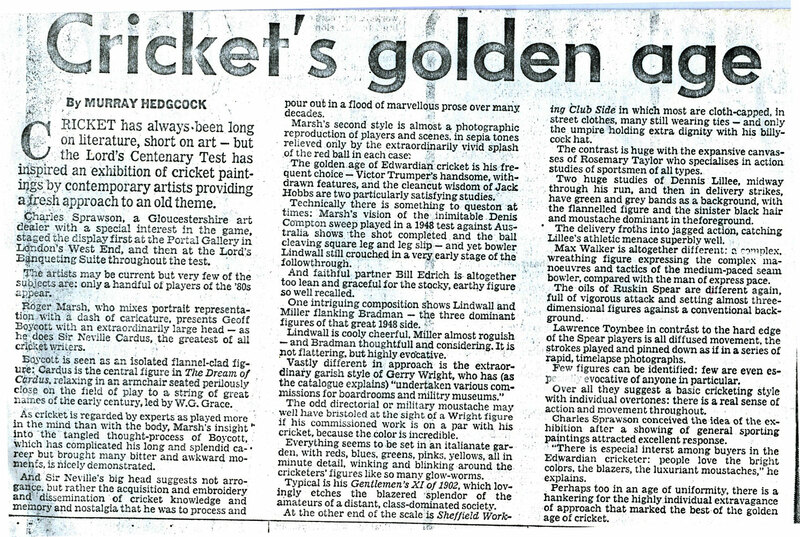 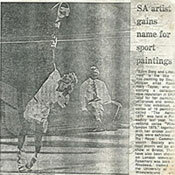 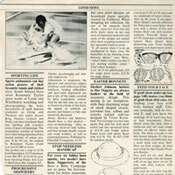 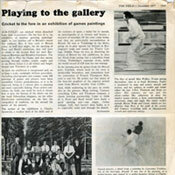 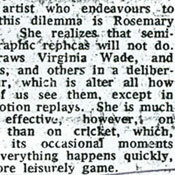 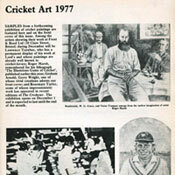 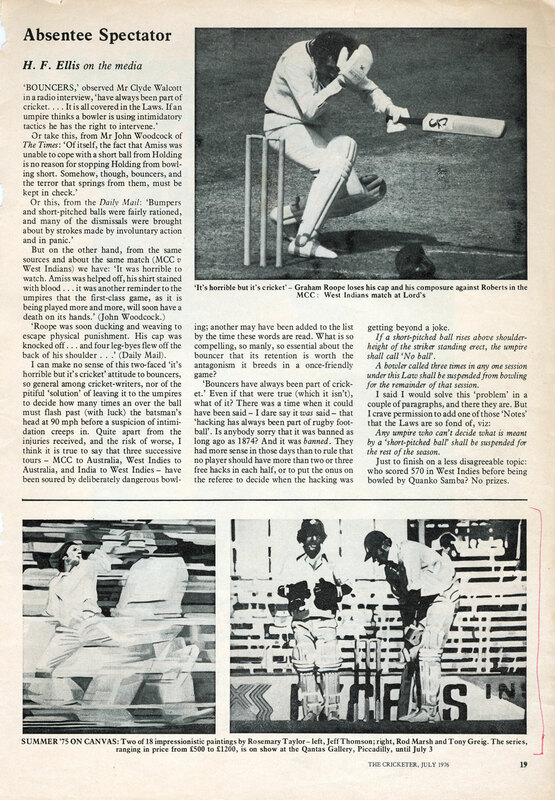 ‘SA artist gains name for sport paintings’ – Article regarding Rosemary’s art exhibitions and Image (Borg and Linesman) in Pretoria News, Wednesday, November 23rd 1977. 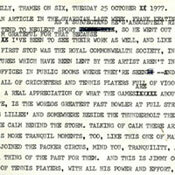 (Author unknown). 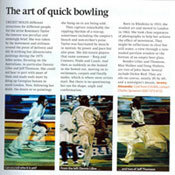 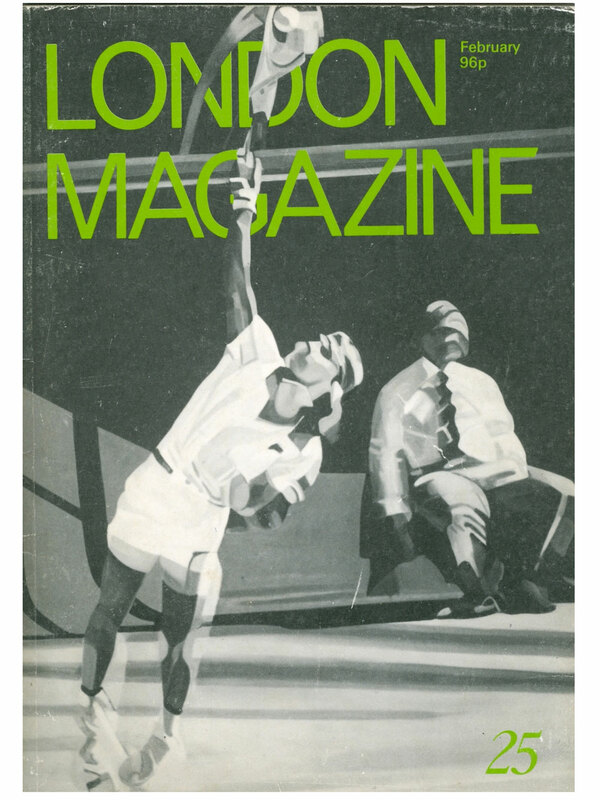 ‘...Rosemary Taylor’s stunningly powerful studies of sportsmen in action...beautifully captures the tension and physical effort of sport, notably tennis and cricket, in motion.’ – John Sansom, pg.21 Bristol and West Country Illustrated, December 1977. 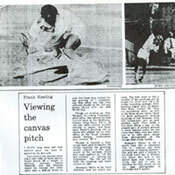 Image of Rosie Casals. 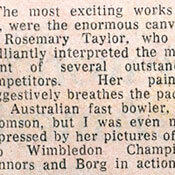 ‘Rosemary Taylor’s interest was peculiar and seemingly brief. 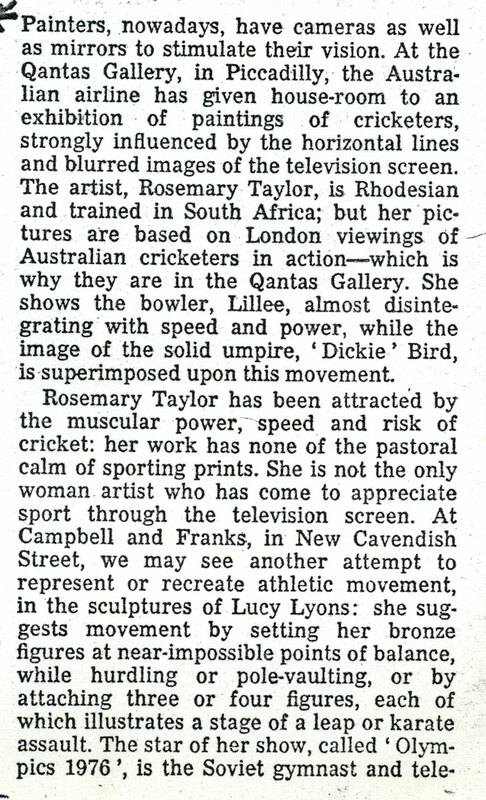 Concentrating on tennis and cricket she was fascinated by muscle in motion, power and pace but also pose. 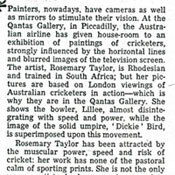 There is no questioning her eye for shape, angle and conformation.’ Jeremy Alexander, The Wisden Cricketer Article, January, 2008 pp19 (IJess Thomson). 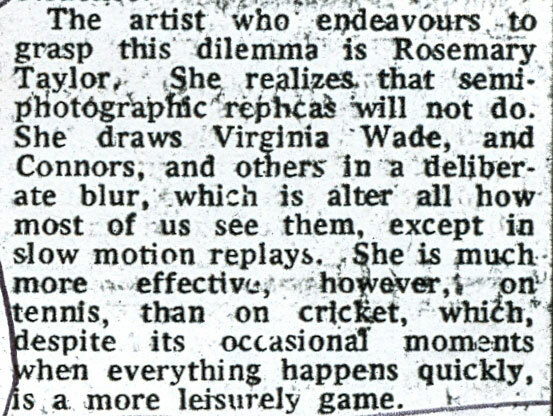 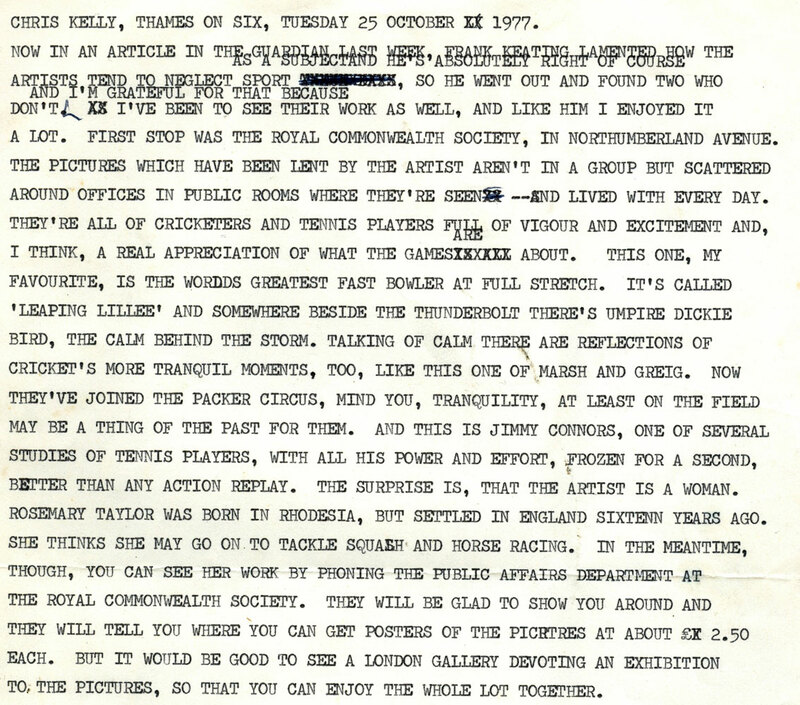 Rosemary Taylor realises that semi-photographic replicas will not do and so draws in a deliberate blur.’ Alan Gibson, The Times, December 14th 1977. 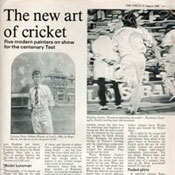 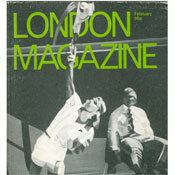 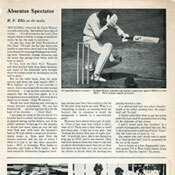 Front cover page of London Magazine; Frebruary 1979.